All brake pads must be bedded in after installation. Even OEM and Genuine pads. 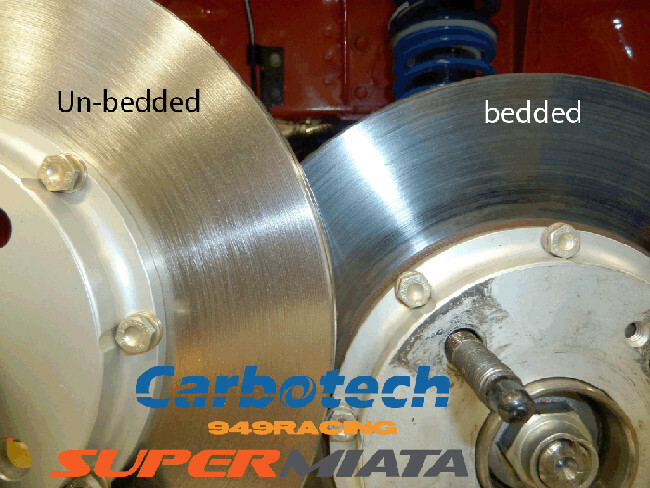 If you don't bed them in the braking will be less effective or even lead to problems like "warped rotors" or brake shudder. The bedding-in process is a 'breaking in' process any time you put new pads on the car (with either new or used rotors). To be completely effective, brake pads need a layer of pad material on the rotor surface. The bed-in process transfers pad material to the rotor in a safe, stable, and consistent manner. Bed-in is not just for track pads - street pads must have this process done as well. Without this consistent layer, you may end up with brake judder, a soft pedal, or poor braking performance. If the pad transfer is not consistent you can end up with high spots of pad material in one area of the disc. As the pad sweeps this high spot, it pushes the caliper piston back in the caliper, which pushes back against your foot, resulting in a pulsation and feels like the rotor is warped. How to Bed BMW Brake Pads. The procedure for bedding-in pads may vary from one pad type to another. It's best to follow the practices outlined by the manufacturer. But all of the procedures are basically the same: a series of stops from graduating speeds using hard braking force followed by a cool down period. Perform bed-in in a safe place! You need a large, flat, straight, and empty area free of obstacles. An office park on a weekend works for me. Ensure your activities will not endanger yourself or others and that you're not breaking any laws (trespassing, etc.). Make sure your brake pedal has the correct travel. Bleed your brakes if it is soft or spongy or travels too far. Avoid bedding pads if the pedal is soft - your results will be inconsistent. Your stops should be moderate-to-hard and "quickly gradual". Avoid activating the ABS. You don't want to be too light and not too hard. The idea is to transfer pad material, not shock the braking system. 1. Start at 20 MPH and brake to 5 MPH. Repeat 3-4 times. Cool the brakes for several minutes by driving at moderate speeds and not using the brakes. 2. Brake from 30 MPH to 5 MPH. Repeat 3-4 times. Cool the brakes for several minutes by driving at moderate speeds and not using the brakes. 3. Brake from 40 MPH to 5 MPH. Repeat 3-4 times. Cool the brakes for several minutes by driving at moderate speeds and not using the brakes. At this point you should smell the brakes burning a bit. This is some of the adhesive burning off and completely normal. It's a sign you're doing it correctly. 4. Brake from 50 MPH to 5 MPH. Repeat 3-4 times. Cool the brakes for several minutes by driving at moderate speeds and not using the brakes. During the cool-down period, avoid using the brakes as much as possible. Drive in circles if you want or follow a large oval course with minimal steering and braking inputs. By this point the brakes should be bedded with a blue-ish colored ring on the rotor surface. This indicates the pad material has been transferred to the rotor. Continue to drive normally and make sure your pedal pressure stays firm. Bleed your brakes again if the pedal becomes soft or spongy. Note that pads have different characteristics. Some pads require higher pedal effort than others. You may need to brake harder and later to get the pads to be effective. Otherwise, the pad may leave a glazing or inconsistent pad transfer to the rotor and you would have to re-bed the pads again to get the correct braking performance back. Some pads - like the Hawk HPS - work better after they have been used hard. I once followed the above procedure on my E46 M3 but the HPS didn't feel right. But Will Turner drove the car and the brakes felt instantly better! Braking is a technique and takes practice to master. You should also partially re-bed pads if the car has been sitting for a few days. This is especially true for metallic pads that may leave a rust impression on the rotor. You don't need a full bed-in as above but a few hard and consistent stops to scrape through the top layer on the rotor.